Payton grew up in Virginia, USA spending much of her childhood outdoors. She chose to put her passion for nature to use as a Biology and Environmental Science double major at the College of William and Mary. A great lover of travel and eager to pursue research opportunities, she joined a professor studying the impacts of fire on red-backed fairy-wrens in Northern Territory, Australia. This experience ignited her passion for field work. She followed this experience up with a semester studying abroad with the School for Field Studies in Kenya and Tanzania. Having dreamed of traveling to Tanzania since completing a fifth-grade project on the country, she found the opportunity to see and study African wildlife more rewarding than she had ever hoped. This experience sparking her curiosity in the relationship between wild mammals and ever-expanding human settlements. Payton joined the Urban Caracal Project to learn more about this important topic and to gain research experience. 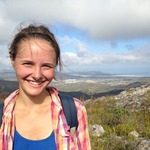 She is excited to understand how caracals are surviving and utilizing the landscape in the Cape Peninsula. She hopes that this experience will help determine her path in pursuing a graduate degree in wildlife conservation or a related field.